Boston, 2000: Calliope Notaris Brown receives a shocking phone call. Her beloved uncle Nestor has passed away, and now Callie must fly to Patras, Greece, to claim her inheritance. Callie’s mother, Clio—with whom Callie has always had a difficult relationship—tries to convince her not to make the trip. Unsettled by her mother’s strange behavior, and uneasy about her own recent engagement, Callie decides to escape Boston for the city of her childhood summers. After arriving at the heady peak of Carnival, Callie begins to piece together what her mother has been trying to hide. Among Nestor’s belongings, she uncovers clues to a long-kept secret that will alter everything she knows about her mother’s past and about her own future. 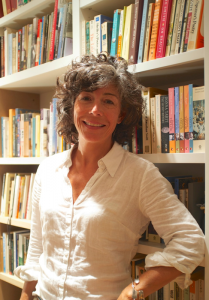 Greece, 1940: Growing up in Patras in a prosperous family, Clio Notaris and her siblings feel immune to the oncoming effects of World War II, yet the Italian occupation throws their privileged lives into turmoil. Summers in the country once spent idling in the clover fields are marked by air-raid drills; the celebration of Carnival, with its elaborate masquerade parties, is observed at home with costumes made from soldiers’ leftover silk parachutes. And as the war escalates, the events of one fateful evening will upend Clio’s future forever. 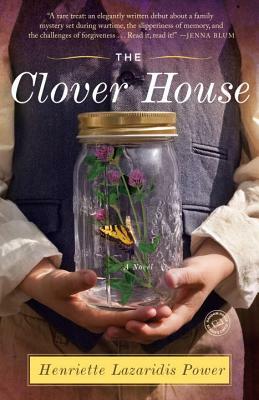 A moving novel of the search for identity, the challenges of love, and the shared history that defines a family, The Clover House is a powerful debut from a distinctive and talented new writer. There were things about The Clover House that I liked a lot. There were also things that didn't work for me. Let's talk about the positives first shall we? The setting in this book was superb. I enjoyed learning about the culture and history of Greece. I finished this book with a much better understanding of what happened there during WWII. I especially enjoyed learning about the Carnival that takes place in Greece. What a party! It seems like anything can (and does) happen during this festival. The characters in The Clover House spend a lot of time celebrating, and making poor choices, during Carnival. Unfortunately, some of the characters in The Clover House were simply unlikable. You are meant to understand that something happened in Clio's past to make her the way she is. Yet when that something is revealed it doesn't seem to be a good enough reason for her to treat her family members the way she does. I found The Clover House to be a enjoyable, plot-driven read. But as a reader I happen to enjoy character driven novels more. Thank you to TLC Book Tours for inviting me to be a part of this tour. To visit the other tour stops please click here. I've been curious about this one and am glad you reviewed it, Jennifer. Hmm. It sounds so good, even with the flaws you mention. Especially given what you said about the culture and history in the book--I think that is what's drawing me to it most in the first place. Thank you for your insightful review! I was just eh about this one, but I loaned it to my mother and she absolutely loved it! I hear ya. There were things I really liked but I couldn't get into the characters. The setting does sound fantastic, but I'm hesitant because of your remarks on characterization. Might get this at the library instead. I really like plot driven novels so this might work better for me. I loved the learning experience, too, although the Carnival setting just gave me the creeps. The historical parts were the most interesting to me. Totally agree with you that Clio's attitude doesn't entirely make sense. My mother had a traumatic childhood that she wouldn't talk about, which she never did get over, but she functioned okay. She was a good mother if a little distant. Carnival sounds pretty decadent and crazy doesn't it? At least in this book ;) I wanted to find out what happened to her mother to have an understand of why she acted the way she did. By the end though it seemed as if she was simply a jerk, lol. I don't think Greece and WWII has ever even crossed my mind in the same thought... I really love fiction with strong historical/cultural overtones, though! I agree with Literary Feline, it sounds like a good reason even with the flaws. It hadn't crossed my mind either. I was glad to learn about it. It's a great book to learn about that time in history, definitely. I suppose I can't ;) I want to though!! Ick, yes, that not-really-enough-to-justify-the-character thing, it's difficult when that happens because you can't help feeling a bit miffed. Still, I like that you hear about Clio throughout, a duel plotline sounds good in this case, and reading about the Carnival must be a lot of fun. Exactly. I was waiting for some awful past to be revealed. Sadly it wasn't enough for me. But I do think that a lot of people will like this book. It has many redeeming qualities. I'm glad that I read it, for the history about Greece alone. Thanks for your honest review. That's a pretty valid reason not to enjoy this book more. You're welcome..I thought so too. I was hoping for a bit more depth to the characters. Maybe I should read about Carnival and skip the book! Carnival and Greece info sounds like more fun! I recently read this book and enjoyed most everything but the characters. I drooled over the descriptions of Greece (having been there and longing to return), the Carnival festival and especially the history. My father-in-law is from Greece, he experienced the war first hand but talks very little of it, understandably so. This gave me a bit of an insight to what that might have been like during that time. I also agree that Clio's past didn't warrant her behavior and Calliope seemed rather reckless. I would read this author again. She's Greek so perhaps we'll get to go back to Greece via another book. I'd read this author again too Lori :) I loved the history and the setting so, so much. Thanks so much for visiting and commenting, I appreciate it! Oooh I hate when the 'justification' for poor behavior doesn't even come close! On a side note, I really want to get in on this book tour!